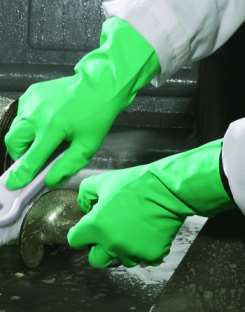 NITRIFit gloves are produced using a high quality acrylonitrile compound. They provide a superior combination of abrasion and chemical protection. Excellent resistance against a variety of chemicals as well as caustics, animal fats and petrolium products. This series includes 100% cotton flock lining to absorb perspiration and also accelerates donning and doffing of the gloves. Applications to include: Chemical Processing, Food Processing that includes Red Meat and Poultry, Production of Paints, Enamels and Inks, Electronics, Furniture and Metals Treatment, Manufacturing.